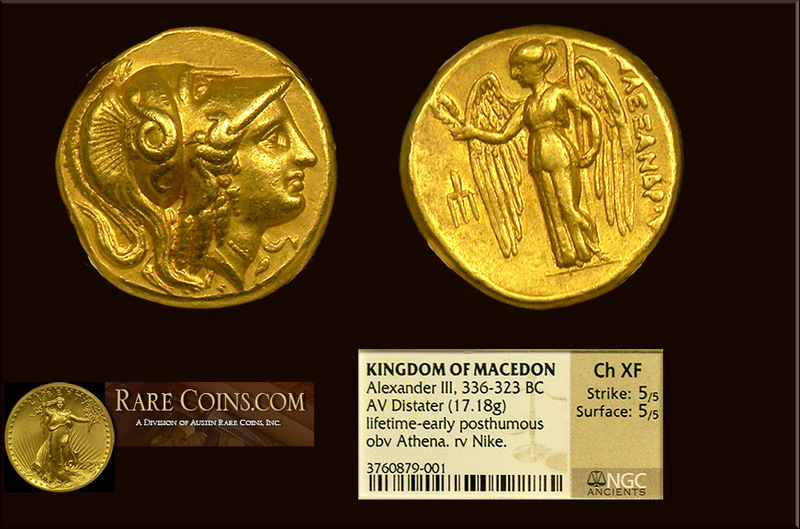 The Alexander the Great Distater, or Double-Stater, is one of the most treasured of all Ancient Gold coins. Containing over a half-ounce of pure gold, this 2,350 year old coin represented a large amount of wealth back then, and one wonders how and why it was protected for the past 2 millenia. Considered by some coin enthusiasts as the “High Relief” of Ancient Gold, the portrait of Nike is struck with superbly high and fine detail, giving the coin an almost three dimensional appearance. The Distater is legions more rare than the typical Alexander the Great Stater, which contains half the gold of this Disater and trades for around 1/9th of the price.